General reaction to the dress: “Yes, yes, that fabric! And oooh, that back pattern matching! But…umm…not so happy about front non-matchingness. And the stomacher just isn’t doing it. I was determined to choose a Rate the Dress that didn’t feature such a single, strong, colour note. And then, when I went searching for the right thing, this dress chose itself. What could I do? Other than the colour, the aspect of this dress that instantly struck me is the hem treatment, with a ruched edging, as well as a gathered ruffle with piped centre. 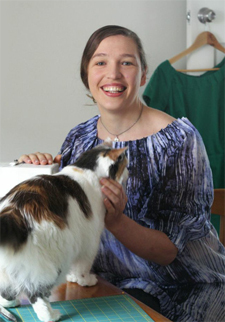 The hem treatment, with its slight variation in shades of green, adds more texture to the figured silk of the dress. 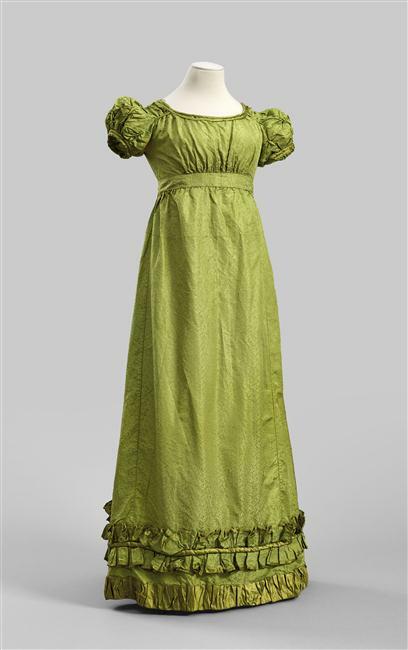 I suspect this dress is shown on a mannequin that is slightly too short, and that it would actually have been worn a few inches off the floor, to facilitate dancing, and to keep the hem treatment from trailing on the ground. And it’s definitely a little crushed and flatted, especially in the sleeves and trim department – but that’s one of those things I always ask you to overlook when rating. So, will green beat out purple and equal (or maybe even beat?) yellow? Let’s find out! I cannot find a thing that disappoints me about this sweet dress. The pretty, poufy sleeve treatment is my favorite part. Love the color, fabric, subtlety of the ruched hem and general appearance. However, my vision keeps getting hung up on the double ruffle. I think I find it just a squidge too large and makes me think that the seamstress attempted to use lettuce leaves, although I very much like the piped center. Puffy, short sleeves have never done it for me–no matter what period features them. Also, the green here is a bit too yellow to be a ptoper spring green. 6.5 out of 10 (because I like the self-decoration and the bodice styling). But what a charming dress in spite of it. Like last week’s, it’s bright and cheery, but feels more youthful. There’s nothing really over the top about it – it’s not that flouncy, it’s not that ornate, it’s not even floral – but it’s such a chipper dress. I can imagine some young Regency lady skimming along in this dress with a huge smile on her face, her hands twisting around her fan as she tries to keep all that sparkly energy down. The dress doesn’t feel very memorable to me, but it makes a fantastic impression. OOOOH!! 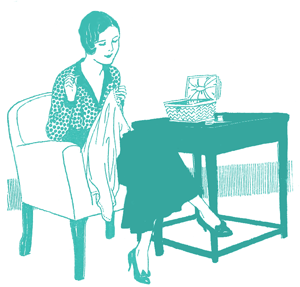 Those sleeves with the rouleau loops! I utterly and absolutely adore the whole trend for using “architectural” features out of the fabric like this dress has. My palms itch to make it for someone. Love it, love the figured silk, like a lot the colour. I know it is not the point and I’d never mark it down but I would so love to see this steamed properly so the silk shines, one a mannequin with accessories and a foot peeking out! The shape is nice, but the green is a little too yellow, and the whole dress feels bottom heavy. Overall, I really like it! I think it’s really pretty and fresh looking. 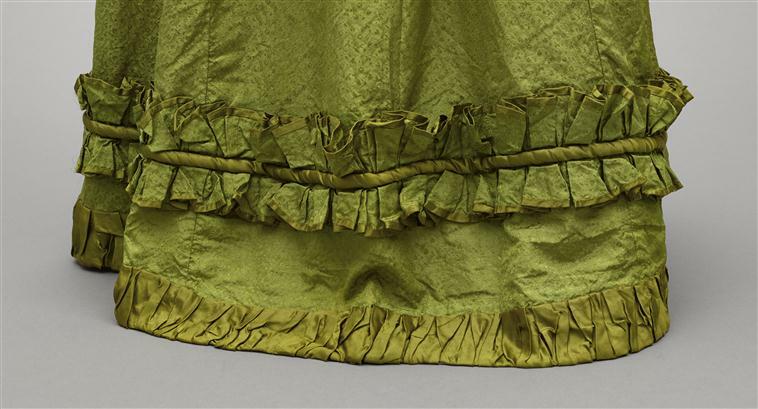 I think the piped bottom ruffle is cute, and I wish the dress ended there, without the other green ruffle. Because that fabric isn’t elsewhere on the dress, to me it looks like it was added to make a hand-me-down long enough. Bottom-heavy is a good way of describing it. Call me Michelle Visage but I just can’t get into that green. Yes, the ball gowns in the “Journal des dames et des modes” from that era stand out in 2 ways. The figure is positively capering, and the dresses are just above anklebone length. Hate the green, love the figured pattern on the silk, hate the fussiness of the late Napoleonic years. 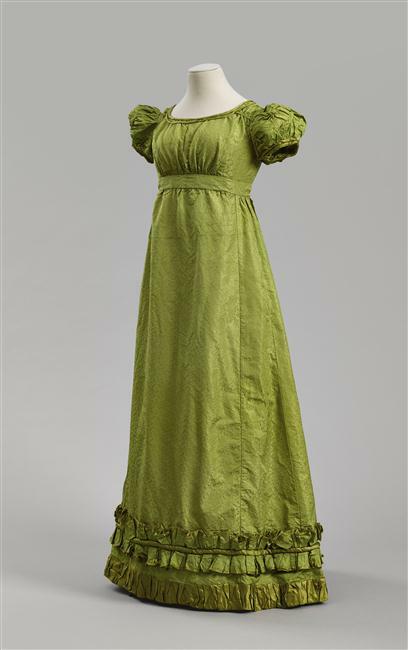 But as an example dancing frock of its era, this had it all, satin cords binding up the sleeves and holding down the ruffle, the fat satin cording on the hem (which may have been rounder when new – they rolled rovings into them). I assume the color difference was either not there or perhaps more definite when this was new. 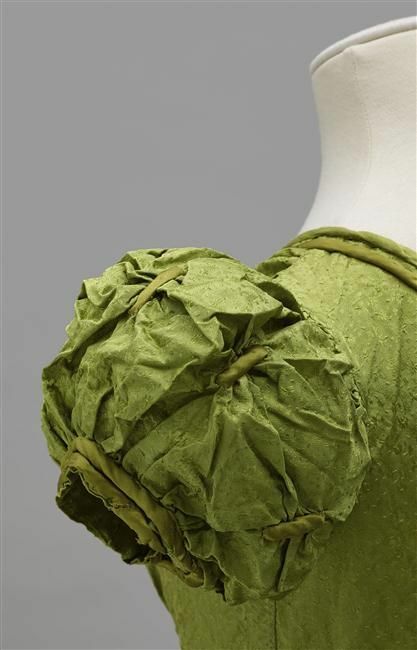 Green fades in strange ways, and the satin and main fabric would have dyed differently. As a vivid leaf green, or with the satin in spring green or deeper green … it works. 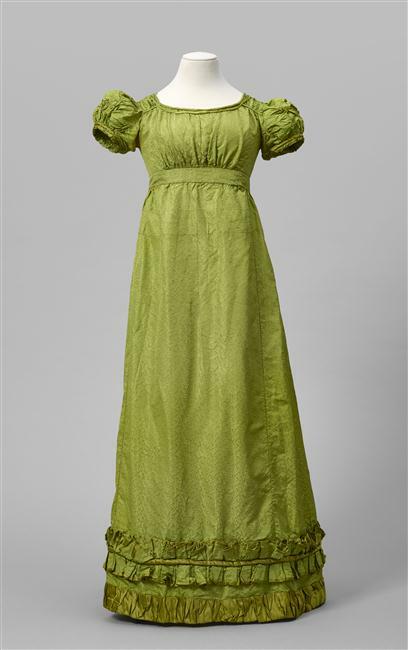 I love green, the hem ruffle is charming, and this dress looks breathable and not constricting! Up close, I like the look of that sleeve construction and cording, even if the poofiness is not my absolute favorite. I like the slightly heavy drape of the skirt. I’m already planning what shoes I’ll wear to go dancing in this. It’s fine. At first I assumed it was later than it is dated, because of the color. I bet it really stood out amongst the then-ubiquitous white gowns. Unfortunately, the color is the most interesting thing about it. After looking at this dress I started browsing through the RTD archives. Less than two minutes later, I could no longer remember what this week’s dress even looked like. 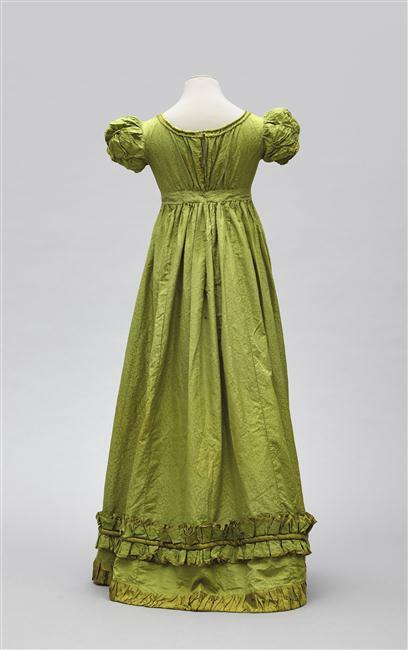 This is maybe a bit harsh, but it’s just your basic regency dress in bright green. Nothing wrong with that, not every garment has to be exceptional, but there’s little about this dress I find distinctive enough to be worth talking about. Green is my favourite colour, and I love the whole dress, I do suspect the bottom trim was added to make it longer for a second owner…. I love this little dress – it’s fresh and pretty, and the sleeve puffs are delicious. What’s not to like? I love it! I can’t find a single thing to criticize. I can picture this being worn to a ball in Lost Hope. Lovely shape overall in the bodice and skirt, and I really like the sleeves, which are just a bit different than anything I’ve seen before. The skirt trimmings don’t seem to have much to do with the rest of the dress; I think I should prefer a simple double band of rouleaux, as used at the neckline and sleeve edge. Is that correct usage of the term for these padded trimmings? And am I the only one becoming distracted by the bias pulling in them? The green is rather disappointing, at least on my screen, where it looks a bit dull, rather than bright and clear. On a side note – I saw the beautiful knitted infant’s cap that you posted on Instagram, and as I can’t comment there, just wanted to mention that it reminded me of early 1900s Amana knitted baby bonnets. The star crown combined with a lace pattern is very similar, though they had no beading. Perhaps it is a case of the already popular star pattern (and the 19th century fad for lace knitted with fine thread) being adapted over time, and to suit plainer tastes. This dress is my favorite color! I really like the sleeves. That said, I wish it had some kind of contrasting trim or accessories. Simplicity is nice but I’m kind of bored by it here. Maybe it really needs a shawl and a brooch or something. I also don’t like the neckline– I want it to be lower. I really like this dress. I am picturing it on a lady with dark brown hair with auburn highlights and a warm skin tone. A Kashmir shawl with some contrasting color would help break up the “Brussels sprout” effect. Hmmm, seems it didn’t like me … Time to re-type my comment. The great thing about website browsers is that you scroll down the picture. 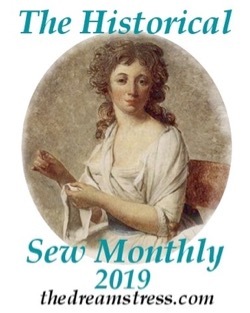 I was thinking oooh, Regency, nice sleeves, I’d like to wear one of these – wait, what’s happening at the hem? Yes, I know it’s style and fashion etc but as someone else mentioned, it looks a bit bottom-heavy. 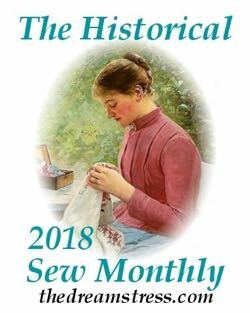 Doesn’t change the fact I want to make something similar – don’t hold your breath, my sewing list hasn’t been diminished after a summer that was meant to be quite sewing-filled! Sorry, they all ended up in the Trash folder, but you’d written a new one before I could rescue them. Next PostThe Eastbourne Trousers – Tester Makes!